This is such a delicious salad! Tart granny smith apple, crunchy toasted pecans, tangy dried cranberries, sweet pear and a zingy dressing make this one of my new favorites. It came together very quickly. In a small non-stick skillet over medium heat toast the pecans, occasionally shaking the pan, until golden and fragrant. About 5 minutes. While the pecans are toasting put the shallot and next 6 ingredients including the vinegar in a bowl and whisk to combine. Continue whisking and stream in olive oil until emulsified. 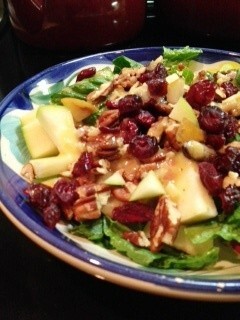 In a large salad bowl place the lettuce, follow with pecans, fruit and cranberries. Drizzle with the dressing and toss. Place half of the salad on each of 2 plates, sprinkle with cheese, and serve. I ate only half of this salad for dinner one night. I did not dress the salad all together. I placed each different component in separate ziplock bags and brought them to work the next day. I wrapped the halves of the pear and apple and brought those separately and chopped them up when I was ready for lunch. It came out perfectly. Makes 2 servings. Adapted from All You, November 2013. I love discovering new salads. 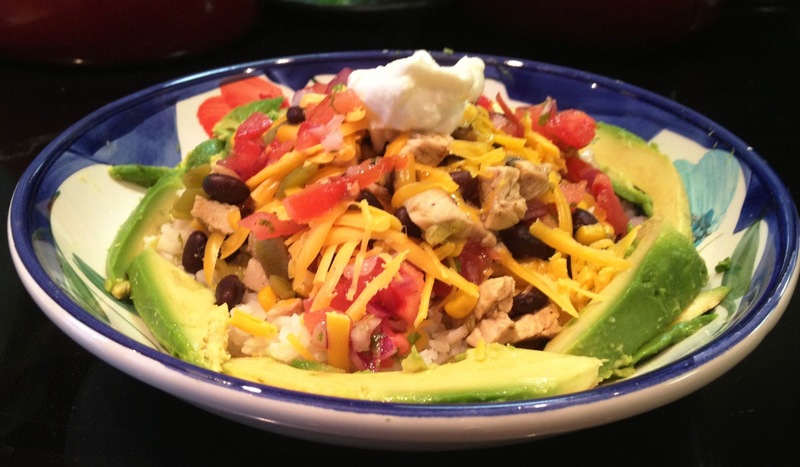 The flavors in this salad really come together nicely-the slight heat from the chicken, the tangy dressing and creamyness of the avocado make for delicious bite after delicious bite. When the chicken is cooking is a great time to prep the veggies and cheese and make the dressing and then it’s just a matter of chopping the chicken and putting it all together on a plate. You can serve this as a lunch, a light dinner or a side salad. The original recipe included fried tortilla strips but I omitted them and replaced with the crispy noodles. Pre-heat oven to 425. In a small bowl combine the first 4 ingredients above and mix to form a paste. Place the chicken in a small baking dish and coat the chicken with the spice paste. Bake for 30-35 minutes or until chicken is cooked completely. While the chicken is cooking prep the veggies and cheese and set aside. Then make the dressing (recipe below) and set aside. When chicken is cooked remove it from the oven and set aside for a few minutes until it’s cool enough to touch. Then cut it into small cubes. 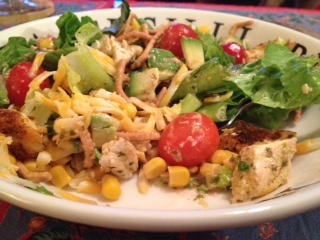 Toss the lettuce, tomato, and corn with most of the vinaigrette (set a little aside to drizzle over the chicken). 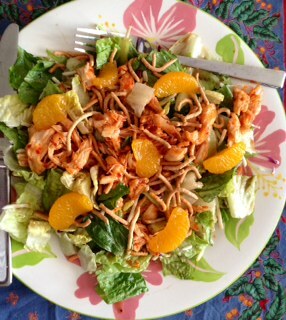 Put the veggies on a plate, top with the avocado, crispy noodles, cheese and chicken. Drizzle with remaining vinaigrette and serve. Place all ingredients into a small food processor and pulse until it becomes a fine paste. Add the olive oil and turn on until emulsified. I have loved this salad for years. I think I first made it about 5 years ago. I love salads that have different components and flavors and this fits that profile perfetly. It’s sweet, it’s slightly spicy, it’s tangy, and it’s just delicious. The dressing is a perfect honey mustard balance and compliments the other flavors perfectly. Genius. The amount of pear and grapes and lettuce is up to you so I didn’t put amounts below. In a skillet set over medium heat toast the cashews until golden brown, about 5 minutes. Set aside to cool. Cook bacon in desired vessel (microwave, oven, stovetop) to desired done-ness, set on paper towels to drain then chop. Give 1/2 slice to dog. In a medium bowl mix the butter, rosemary, cury, brown sugar, salt, cayenne pepper and toasted cashews. Mix until everything is evenly distributed. In a small bowl whisk together the vinegar, mustard and honey. Then add the olive oil while whisking to combine. 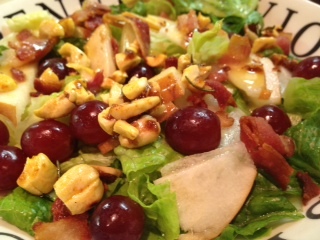 When you’re ready to serve it place the lettuce in a bowl, add some cashews and grapes and drizzle with dressing. Gently stir to combine. Top with bacon and pear slices. Or forget that whole bit and just put everything together in a bowl with dressing and mix it around. Adapted from a recipe I printed 5 years ago from allrecipes.com. Sometimes it’s surprising how tasty something that is so easy and that has just a few ingredients is, isn’t it? The title of this recipe doesn’t lie. It’s easy. But it’s also fab!! For a recipe swap for ‘Summer Salads’ with some fellow food bloggers I was given this recipe from Jenni’s blog www.doughseedough.net and I’m so glad! As the recipe title suggests it is truly easy so it’s a snap to just put together in a flash. I adjusted her recipe a bit (I roasted the peppers in the oven instead of in a pan on the stove to cut down on the oil) and I halved her original recipe as it’s just me eating it. In a medium sauce pan over medium/high heat add the broth and quinoa and simmer until cooked to desired consistancy (for me that’s about 14 minutes-I like it al dente), drain remaining broth if necessary. Set aside and keep warm. While the quinoa is cooking pre-heat oven to 375. On a baking pan lined with foil arrange the peppers in one layer, sprinkle with garlic and drizzle with the olive oil. Sprinkle with salt and pepper to taste and roast for about 15 minutes. 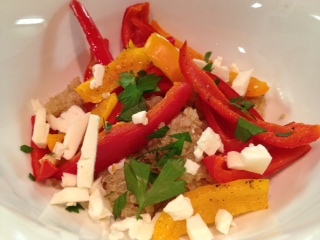 In a large bowl combine the quinoa and peppers/garlic and stir. Top with feta and parsley and serve. 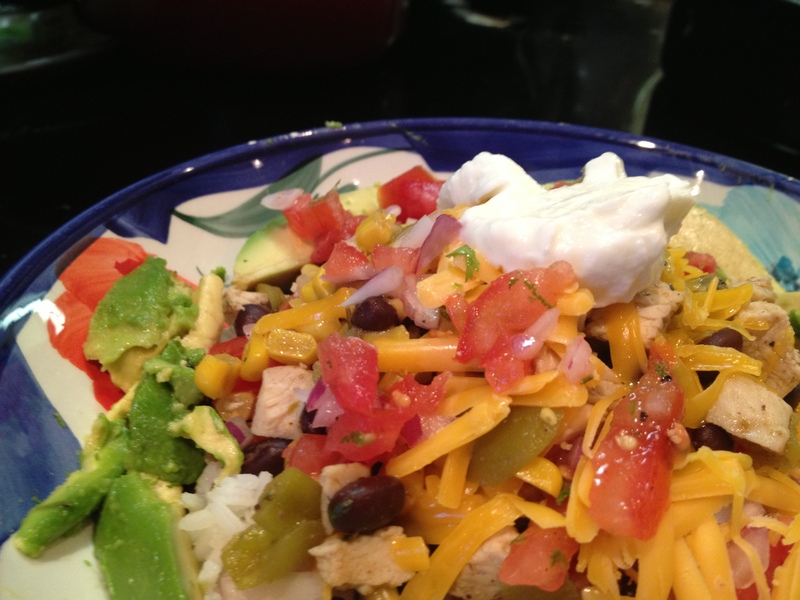 Check out the other great salads in the swap here!! Some times I like egg salad. Those times include when it’s not drowning in mayonnaise and when it’s zingy! 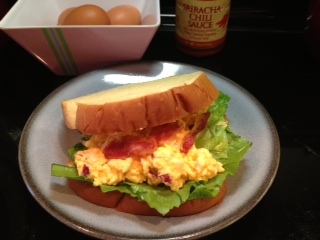 Who likes mushy bland egg salad is a mystery to me….. The egg salad below is anything but mushy and bland. It’s really tasty and it’s light and airy. If you like bacon and sriracha and eggs you’ll like this a lot. Gently chop eggs and yolks and put them in a bowl. Add everything else but the 1 strip of bacon, bread and lettuce and stir gently. Place lettuce on one slice of bread, top with salad, top salad with bacon, place 2nd slice of bread on top and enjoy. This is one gigantic delicious salad filled with great flavors and textures. The zingy chili sauce, the slightly sweet dressing, the crunchy noodles, the bright mandarins and the crispy veggies-everything just comes together. I named it ‘Red Dragon’ chicken salad because of the zing, heat and red sauce on the chicken. Besides it sounds much better than plain old ‘chicken salad’, no? Yes. Unfortunately I can’t take full credit for this salad. 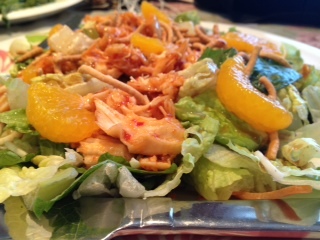 I based in on a salad that I enjoyed a few weeks ago at Buffalo Wild Wings with Husband. It was our first visit. I’m not a fan of chain restaurants but I liked it there more than I thought I would. The wings were delicious and they have a great variety of foods. Put salad and dressing together, toss to combine. Sprinkle noodles over the salad. Set aside. Mix the Asian Zing sauce with the chicken and spread over salad. Arrange mandarin slices around the outside. This makes one large salad or 2 smaller salads. *their Asian Zing sauce tastes to me like Sweet Thai Chili sauce and sriracha so if you don’t have the sauce or want to buy it you can mix those 2 ingredients together to the desired heat level and use that on the chicken instead. I admit I’ve never had a burrito bowl. I hear a lot about them but never actually ate one. I mean I guess, essentially, it is just really a salad of sorts but with the contents of a burrito without the actual burrito. Ok. So for this month’s swap with the Mexican theme hosted by Sarah at http://tasteofhomecooking.blogspot.com I was given the burrito bowl from Jenni’s blog doughseedough I was pretty excited. It looked delicious and I love burritos! It didn’t disappoint. What a great recipe. It came together pretty quickly (it took less than an hour including all prep and rice cooking from start to finish on a weeknight) and was just good all around. Jenni’s recipe called for brown rice but since I’m not really a fan I used white. I also added some green chilies and corn. That’s what was so nice about her recipe-the ability to add or remove something to taste easily. So go make one to your taste!!! Cook rice according to package instructions. When cooked stir in half of the cilantro, half of the lime juice and half of the lime zest. Set aside. In a small bowl mix the chili powder and other spices through the italian seasoning and set aside. In a skillet set over medium/high heat warm the oil. When hot add the chicken and cook until cooked through. Place the chicken on a cutting board and chop into small pieces. Put it back into the same pan. Into that pan add the spices from step #2 and stir to combine for a minute until spices are fragrant. Into the same pan add the beans, corn and chiles and lower heat to medium/low to heat the new ingredients and stir to evenly distribute the spices. If desired add a few splashes of salsita for a kick. In another small bowl mix the tomatoes, the remaining cilantro, zest and juice of the lime and the onion and stir. Season with salt and pepper if desired. Assemble your bowl! Start with some rice on the bottom, some chicken and bean mixture, some of the tomato mixture and top with whatever you’d like! I made mine this way: rice then chicken mixture then grated cheese (so it would melt-YUM), tomato mixture, sour cream. I sliced half of an avocado and put the pieces around the plate. This recipe makes about 2 medium sized soup bowl’s worth. 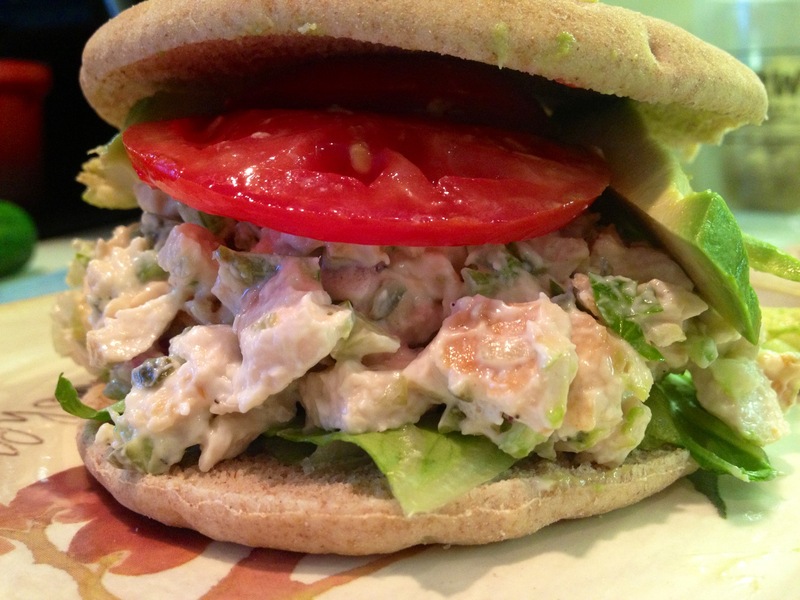 Every once in a while I get the urge to have a chicken salad sandwich. I’ve tried a few recipes over the years and wasn’t ever happy with any of them for one reason or another-too much mayo, didn’t like the curry etc… and I didn’t ever take the time to mess around with the recipes to get it just right. So I’d go to my local deli and get a chicken salad sandwich which is neither waist-line or budget friendly. Well my friends-my search is over. Last night I made (in my opinion anyway) the perfect chicken salad. Not too much sauce, tang from the gherkins (or cornishons if you’re feeling saucy), crunch from the celery, onion and gherkins, and a ton of flavors from the Dijon, lemon juice and parsley. The best part is I don’t feel like I’m the size of a hippo after I’ve eaten it-and it’s just darn tasty to boot. I ate my chicken salad sandwich on one of the Pepperidge Farm sandwich flats with sliced tomato, a few wedges of avocado and some romaine lettuce and it made a pretty tall sandwich. I think this would also be great served on pieces of cucumber, rolled up in lettuce leaves or even crackers for an appetizer. This would also be amazing eaten from an avocado cup. I think I’ll try that next time. Add everything into a bowl and stir to combine. For the celery, onion and gherkins I used my little Kitchen Aid chopper to have all uniform sized pieces. I cut the chicken breast into about 7 equally sized strips and then cooked them on my panini press. I then cut them up into small nugget sized pieces and put them on a plate in the fridge to cool down so that I could make the salad. They only took only about 25 minutes to cool. I cannot believe Memorial Day Weekend has come and gone. It’s almost time for summer fruits and veggies again. 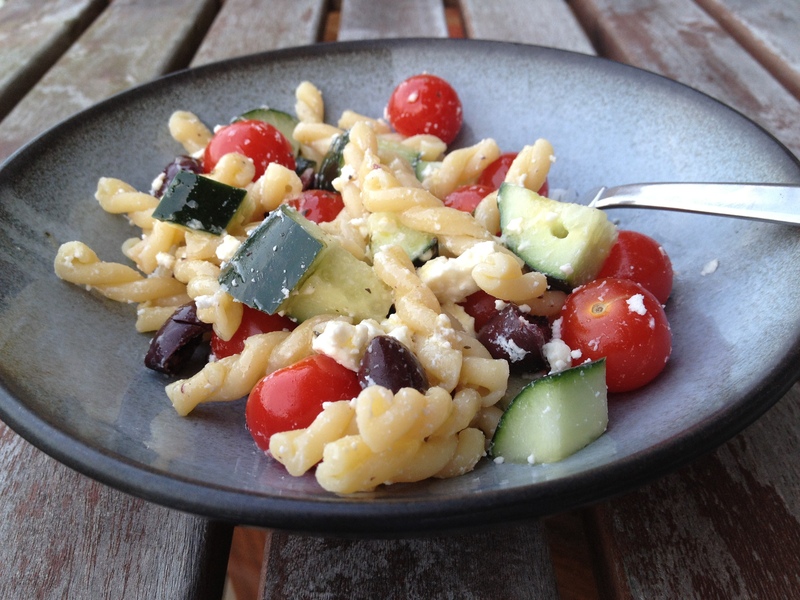 That being said this pasta salad is perfect for the warm weather. There’s a ton of veggies, a bit of cheese and a great light vinaigrette. It can be made in advance and kept in the fridge too. You can feel free to add other veggies too-maybe some red or yellow peppers, onions etc…. Cook pasta in salted boiling water until al dente, drain and rinse with cold water. Shake out as much of the water as possible. In a large mixing bowl combine all of the salad ingredients above and mix well to combine. In a small bowl whisk together all ingredients except the olive oil until evenly combined. Then, while whisking, add the olive oil and continue to whisk until emulsified. Pour dressing over salad, mix to evenly distribute the dressing, and serve or refrigerate until ready to serve. I know, I know. You’re thinking “Ah the ubiquitous strawberry salad”. You’re thinking of those sad restaurant ones that every chain place has that are so sad-a few strawberries, a bit of spinach, sweetened up nuts, maybe a little cheese and a vinaigrette. It’s insulting to the strawberries if you ask me. Those are NOT this salad. I wanted better. I wanted it to be more my way. After roasting rhubarb for (this recipe) dessert a while ago I got to thinking-why not roast strawberries for the salad? 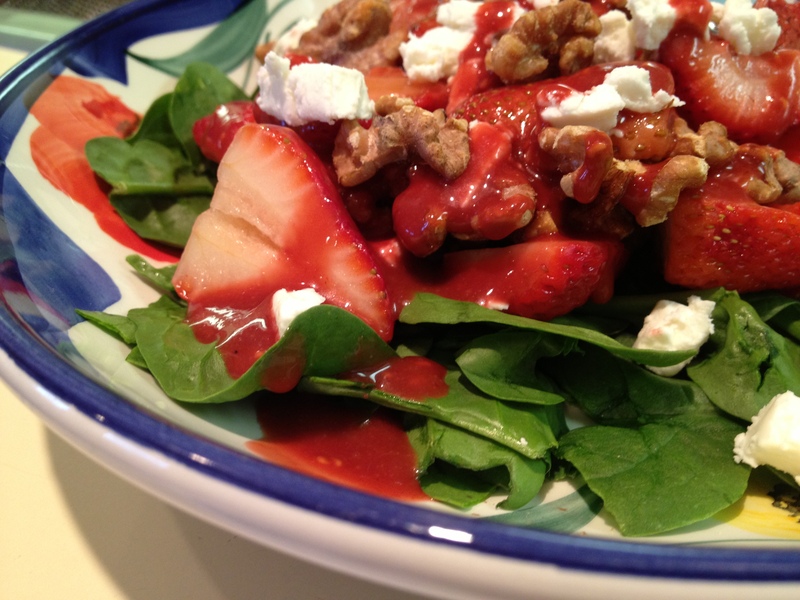 Why not have both roasted and fresh strawberries in the salad? 2 different versions. Yum! Feel free to up or less as you please-the amounts below are just how much I used. You like more cheese? Be my guest! I’ll never think badly of anyone who wants to add more cheese. Dont’ like nuts? Perhaps some carrot or celery or crisp apple to replace the crunch. So I hope you love it. It certainly put a new spin on this for me. Preheat oven to 400. Line a rimmed baking sheet with parchment paper and set aside. Take half of the strawberries and lay them on half of the baking sheet, drizzle with olive oil, salt, pepper and sugar. With your hands move them around a bit to make sure they’re all olive oiled. On the other half of the baking sheet place the walnuts. Roast in the preheated oven for 10 minutes. Let them cool. While they are cooling make the dressing. Add all ingredients above to a bowl and use a stick blender to combine. Add more or less honey depending on the tartness of the raspberries and strawberries. If it’s still too tart a sprinkle of sugar should be added. Assemble the salad starting with the spinach then half of the roasted and fresh strawberries, half of the walnuts, half of the cheese and dressing as desired. See? 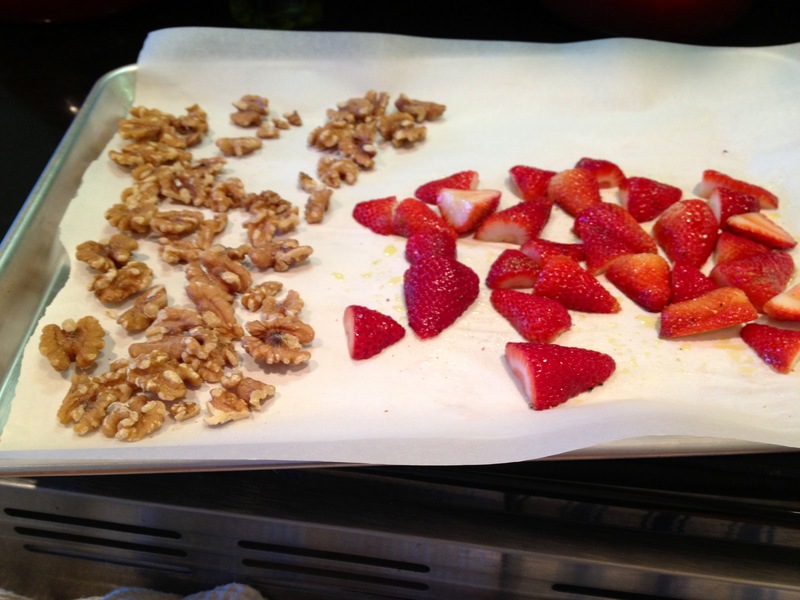 The walnuts and strawberries are happy to roast together.